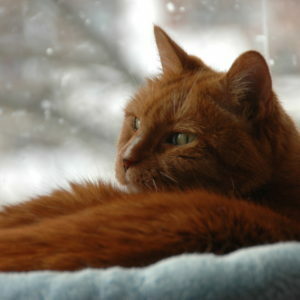 › Keep Your Cat Healthy › What Is Normal? Your cat is unique, as you already know. So, it is best to know what is normal for your specific cat and not just what is average for all cats. Start by paying attention to your cat’s daily routine and write it down so you can refer back to it as needed. Try to add in some general details of their routine so you know when something has changes. This will help alert you to early signs that something may be wrong. When you notice changes in your cat’s normal routines – even small changes, speak with your veterinarian before it turns into a bigger problem. 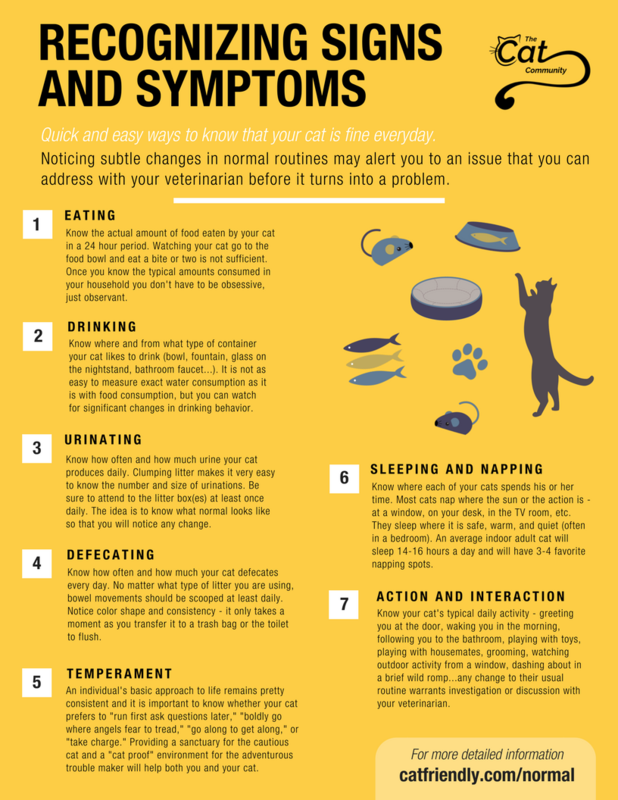 Here’s a list of common signs and symptoms that mean you need to bring your cat to the veterinarian. Know the typical amount of food your cat eats in a 24 hour period. Measure out portions of food, especially dry food. Keep track of any treats or snacks you offer your cat. This is the only way to really know how much food your cat eats daily. Once you know the usual amount of food your cat or cats eat, you don’t have to obsess over it. Just stay observant. Know where and from what type of container your cat likes to drink (bowl, fountain, glass on the nightstand, bathroom faucet, etc…). It is not as easy to measure exactly how much water your cat drinks as it is to measure how much food they eat. However, you can look for changes in their drinking behavior. The average daily volume of water your cat may drink from water resources can vary widely. If your cat eats dry food (primarily or exclusively), they will probably drink more water than cats that eat canned/wet food. A good indicator of “normal” water consumption is consistent urine volume. Know how often and how much urine your cat produces daily. If you use clumping litter, it is very easy to know how many times your cat urinates and the size of their urinations. If you use absorbent litter, you can note the number and size of wet spots before you scoop the poop and stir the litter. For households with more than one cat and more than one litter box, you can still know the total amount of urine produced each day. Just divide by the number of cats and it should be close to the average. An average adult cat produces 2-3 handful size urine balls per day. Cats are creatures of habit, so if you stay observant you can have a pretty good idea of which cat is urinating in which area of each box. Be sure to clean all litter boxes at least once per day. The idea is for you to know what “normal” looks like for your cat so you can notice any changes. Know how often and how much your cat defecates every day. No matter what type of litter you are using, bowel movements should be scooped at least daily. Notice color, shape, and consistency – it only takes a moment as you transfer it to a trash bag or the toilet to flush. An average adult cat defecates once every 24 to 36 hours and produces a stool about the size of an old fashioned Tootsie Roll candy bar. It should be a dark brown color, well formed, moist enough that the litter will stick to it, and emits an odor, that while not pleasant, should not drive you from the room. Know where your cat or cats spends their time. Most cats nap where the sun is or the action is (at a window, on your desk, in the TV room, etc.). They sleep where it is safe, warm, and quiet (often in a bedroom). An average indoor adult cat will sleep 14-16 hours a day and will have 3-4 favorite napping spots. Favorite spots may change with time of day or may change randomly. Cats look luxuriously comfortable at rest. A napping cat should be alert and responsive when something interesting happens. A sleeping cat will look a bit groggy when disturbed. Cats withdraw rather than complain when they don’t feel well. So if your cat is not spending time in her usual places, she may have a problem. Consult your veterinarian and share your observations. Know your cat’s typical daily activity. Does she greet you at the door, wake you in the morning, follow you to the bathroom, play with toys, play with housemates, groom, or watch outdoor activity from a window? If you keep cat toys in a box, are they eventually found scattered around the house? If your cat is usually active, are the throw rugs rumpled and out of place when you get home? Any change to your cat’s usual routine means you should do a little investigation and discuss the changes with your veterinarian. Provide a sanctuary for a cautious cat and a “cat proof” environment for an adventurous trouble maker.